Bryan O'Leary - Button Accordion player. Bryan is twenty one years of age and comes from Tureencahill, a townland halfway between Ballydesmond and Gneeveguillia, in the heart of Sliabh Luachra. He is currently a student at the University of Limerick, studying Irish Music and Dance. Shortly after his grandfather, the great accordionist Johnny O’Leary, (a TG4 Gradam Ceoil Lifetime Achievement recipient in 2003) passed away, young Bryan, aged 10, started to learn the accordion at his local national school from Henry Cronin. Through his teens, he attended classes with the respected teacher and multi-instrumentalist Nicky McAuliffe from Castleisland. He also took a great interest in his grandfather’s music, learning it by ear and researching the old recordings. Not surprisingly, he quickly became aware of and was influenced by the music of other Sliabh Luachra stalwarts such as Denis Murphy, Julia Clifford, Pádraig O’Keeffe and Paddy Cronin (a TG4 Gradam Ceoil Lifetime Achievement recipient in 2007 ). In the past few years, he has also enjoyed sharing and playing music with Billy Clifford thus extending into another generation the musical links between the O’Leary and Murphy/Clifford families. 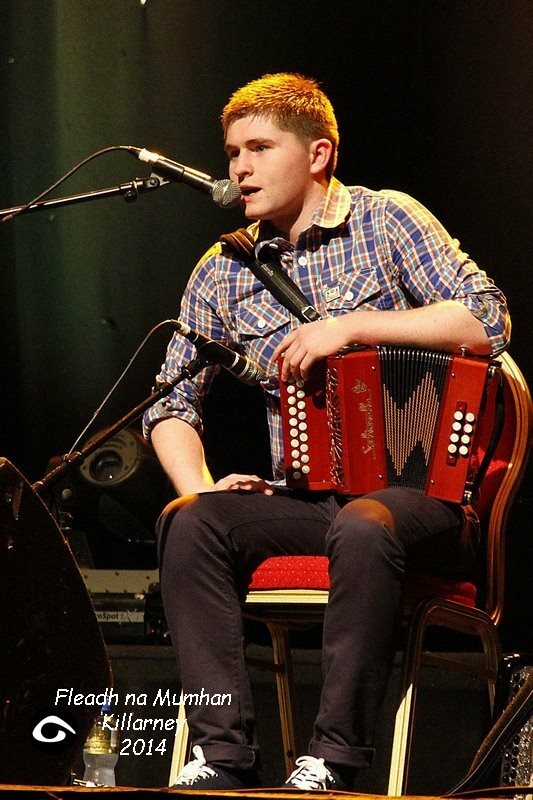 Other strong musical influences on this very talented young player include legendary accordion player Jimmy Doyle from Maulykaevane, Gneeveguilla along with his two musical partners Joe O’Sullivan (flute) and Paudie Gleeson (fiddle). Kerry accordion players Paudie O’Connor, Brendan Begley, John Brosnan, Danny O’Mahony, and the late Stephen Carroll have also influenced Bryan in the past number of years. He has played at various festivals including Scoil Samhraidh Willie Clancy, Scoil Cheoil an Earraigh, The Pádraig O’Keeffe Festival, The Gathering Festival and The Con Curtin Music Festival. He has performed on many TV and radio programmes in the last few years such as Geantraí, Oireachtas na Gaeilge, The Rolling Wave, Céilí House, Raidió na Gaeltachta and many other programmes on TG4, Clare FM and Radio Kerry. In 2014, Bryan won the prestigious TG4 Young Musician of the year award, which has been the highlight of his musical career to date.